Hello Southern California Bride readers! My name is Jen Carreiro and I write a creative wedding blog called Something Turquoise, that truly embraces the DIY bride. I was a major DIY bride - but I was also a destination beach wedding bride, and I’m completely obsessed with beach weddings - almost as much as I am with DIY weddings. So when Damaris started this blog I was all over it! Isn’t it just lovely? 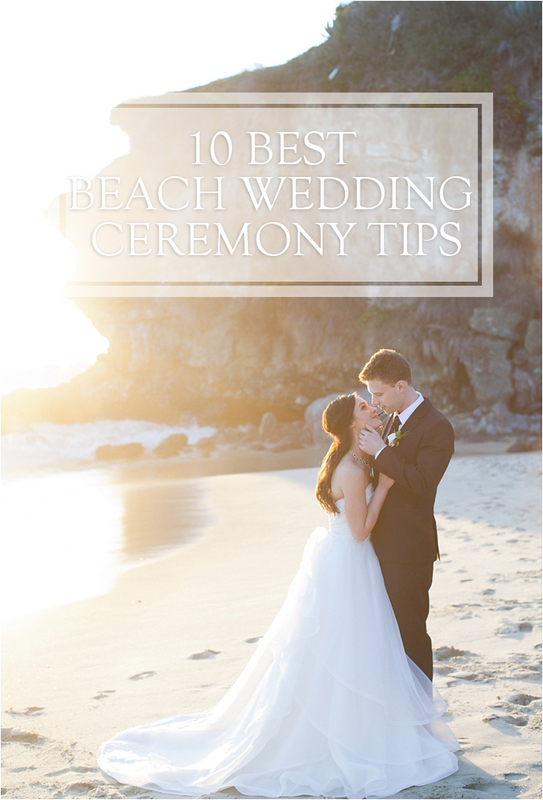 As a huge fan I was inspired to write a special article just for you about my 10 best tips for having a beach wedding ceremony. Although these might point out all the risks of celebrating your love in the sand... I feel that a beautiful beach ceremony is soooo worth it. If you can keep these simple tips in mind while planing your seaside event, it’s sure to go off without a hitch! 1. Sandy Feet. It’s not easy to walk in the sand with shoes, so you might want to think about kicking them off before you reach the sand. Keep in mind that it’s also not fun to put dirty sandy feet into shoes of any kind. So my tip for you is to make time to rinse, wipe (with wet wipes) or wash your sandy feet before you put them into your beautiful wedding shoes. It will not only keep your new shoes clean but it will also make your feet very happy for the rest of the day. 2. Beach Hair. On any other day beach hair is fine, great even. The ocean air does crazy things to hair, so if at all possible have your hair dresser on hand to do touch-ups right after your ceremony. Keeping your locks fresh and camera ready. You’ll be glad you did. 3. Possible On-lookers. Since most beach wedding venues are public beaches, the possibility of on-lookers is very high. Ask your wedding planner or venue what they do to make sure that at least during your ceremony, no thong-clad beach-goers will be photo-bombing you. 4. Clear Directions + Parking. Getting to a beach ceremony location can not only be tricky but it can be very hard to find parking. Include this type of information on an insert card in your wedding invitation or on your wedding website. If on your wedding website maybe even add a few pictures, it might help. 5. Wind. It’s the beach and there is a major possibility of wind. The later your ceremony the worse the wind could get. One day the beach will be beautiful and still and the next day the wind is so bad the sand is flying and hitting your legs like little needles. Make sure to have some type of ‘wind’ backup plan, just in case it’s too much to bear. I know this sounds awful, but it’s one detail that is too often overlooked. 6. Sunshine. Make sure to spend some time out on the beach at the exact moment that your ceremony is to take place and make sure that you are ok with the amount of possible sun. Stand as you would during your ceremony and make sure that no one (bride, groom, attendants, officiant and guests) will have the sun beating into their eyes. You want everyone to have a pleasant sun experience and to be able to see you making the biggest commitment in your life. The sunshine will also play a part in your photography. If the sun is high and bright it will cast shadows. Another good tip is to take pictures at that same time, right where you will be standing so that you know exactly how you will look in pictures. No surprises. A slightly overcast day actually makes the perfect beach wedding pictures. 7. Trash. Delegate someone (or a couple people) to make sure that there isn’t loads of trash in the sand around your ceremony. Nothing worse then your guests finding a plastic bag with old food in it or tons of cigarette butts. Yuck. 8. Sunset. Take advantage of the beautiful light and how it changes throughout the day. Communicate with your photographer about the time you will be taking portraits and if there are specific times that you might want to go back to the beach to take more portraits, just when the light is right. 9. Signs + Sand. We are huge fans of wedding directional signs, especially those shoved in the sand. But what you might not realize is that some sand is either too soft to hold a sign or too hard. If you are planning to incorporate this detail into your event, take your sign to the location if you can and make sure that the sand will hold it - or that you can get it into the sand with little effort. Many a father has been pounding away at a sign to get it to stick in the ground... and no one wants to be worrying about that. 10. Sweat. Our last and final tip is to stay in the shade! Actually it’s to have cute umbrellas on hand. Standing in the shade on the beach can decrease the temperature by 15 degrees. Not just for you and your bridesmaids but possibly for your guests as well. If you have a long walk to the ceremony destination, if you have a long ceremony, or if you have elderly guests - providing inexpensive paper parasols is a lovely touch that will be much appreciated by all.